Paula Crown's art installation in the Doerr-Hosier building at the Aspen Institute. Paula Crown raised her artistic profile in Aspen a notch on Friday when she presented one of her art projects at the Aspen Ideas Festival. The work consists of manipulated images of Paula Crown’s brain scans taken via magnetic resonance imaging (MRI). “To me everything is a potential art project, including these brain scans,” said Crown, who suffers from migraine headaches and had an MRI done as part of treatment. 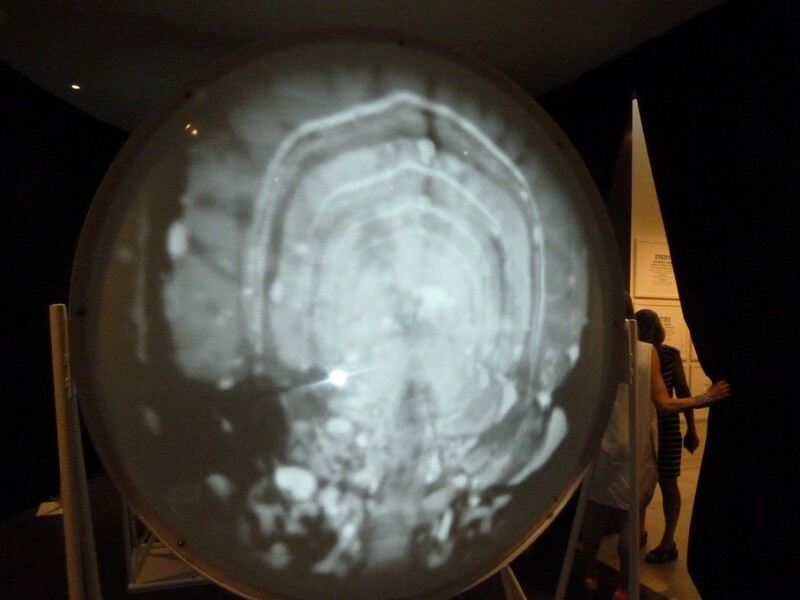 The resulting art work is presented between two large convex screens (envision standing between two glowing satellite dishes), and it provides a trippy look inside Crown’s head from multiple angles and perspectives. “I think of it as painting with tools of technology,” she said. As Jim Crown showed the installation to other Crown family members on Friday, he noted that one could make out the blood vessels in Paula’s head. “There is a bit of ick factor,” he said lightly. Paula Crown’s brain-scan project was an outgrowth of a series of other projects she’s been working on, all based on a drawing she made in a helicopter flying over a rough landscape in South Africa. She took the drawing, which she purposely made in an uncontrolled environment, and then scanned it — in a powerful high-tech scanner in Spain — to produce digital landscapes comprised of highly magnified 3-D images, formed out of the lines she originally put on paper in a helicopter. “I felt like I was excavating into the paper, which was really fun,” Crown said of the process. Another project that resulted from the helicopter drawing was called PERforations. Crown took scanned 3-D images of the ragged edge of the “helicopter drawings” as they were torn from a sketch book, and then turned them into physical sculptures. “That artistic journey has really affected me,” Crown said of PERforations. Originally from Marblehead, Mass., Paula Crown worked in real estate finance on Wall Street before joining the Crown family business, Henry Crown & Co., and raising four children. Those activities kept her from pursuing her long-simmering passion for art, she said. About five years ago she took a number of drawing and painting classes at the Anderson Ranch Arts Center in Snowmass Village, which rekindled her passion for art. Then Crown enrolled in the School of the Arts Institute in Chicago and graduated with a masters in fine arts in 2012, freshly emboldened to pursue her art where it might lead her. In Aspen, her artistic sensibilities have been on display in a number of venues. She commissioned the art that was installed as part of the renovation of the restaurant in SkiCo’s The Little Nell hotel, now called Element 47. There is a popular art installation in the new Elk Camp restaurant at the Snowmass Ski Area, the SkiCo has partnered with the Aspen Art Museum on a series of artistic lift tickets and ski passes, and she oversaw the interior design of the Aspen Mountain Club. “It really goes to our core,” Crown said of her local art projects. In Chicago, she played a large role in the selection of the artists for the interactive Crown Fountain in Chicago’s Millennium Park, which since 2004 has become a highly popular spot among both visitors and residents, Crown said. About 50 people came to hear her presentation on Friday afternoon in the small downstairs Kaufman Room in the Doerr-Hosier building, including her husband Jim and other Crown family members. Jim Crown is on the board of trustees of the Aspen Institute and this year’s Ideas Fest includes a “Citizen Artists” track, which Paula Crown enthusiastically praised before her own presentation. Her presentation was slightly marred by some technical glitches — someone leaning against a wall knocked a plug out of its socket which caused her computer to go down — and she wasn’t able to show a culminating video of some of her work. But Crown carried on as best she could and the supportive crowd was pulling for her. “I’d be happy to take a few questions on anything other than the technical uploading of the videos,” she joked, before calling on a number of people by name. Her art installation in the Doerr-Hosier building is on display for those attending the Ideas Fest until July 3, when it will be open to the general public until Sept. 2. Editor’s note: The Aspen Daily News also published this story, on June 29, 2013.